Another anitbody for the detection of TGF-beta Receptor I is now successfully validated in immunhistochemistry. Human colon tissue was used as positive control, while no signal was seen in human adipose tissue sections. Since we started the initiative we have successfully validated 92 products. The first was a anti-Fibrinogen antibody, followed by a couple of other interesting antibodies and ELISA kits. The latest succesfully validated product is the antibody for the detection of TGF-beta Receptor I. A few more products are currentlly being validated. 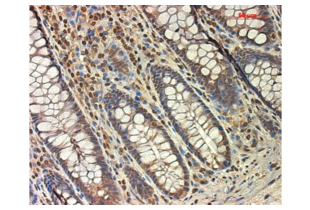 Further validated products for IHC can be found here: "validated products for IHC"